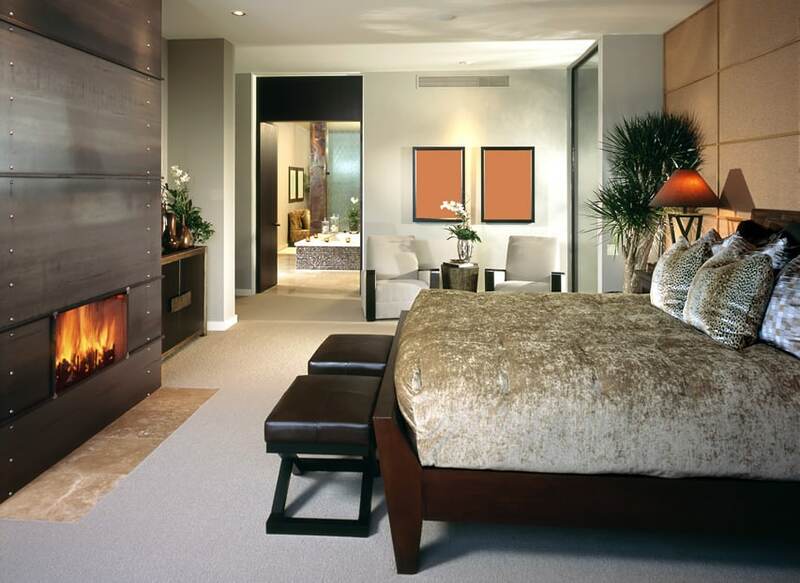 These luxury designer bedrooms are arranged to provide a variety of styles for ideas and inspiration. Your bedroom should be a sanctuary and a quiet place where you can retreat to unwind and rest after a long day. 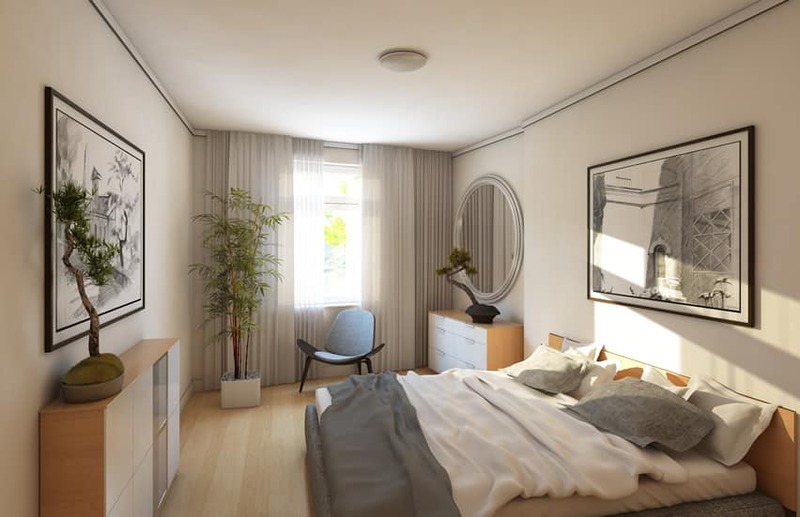 As it should be a place that you will enjoy being in, you need to make sure your bedroom is decorated in a style that pleases you and fits your personality and style. In the picture shown above a large modern bedroom enjoys a great amount of sunlight coming from its large black-framed windows. Wall finishes and ceiling are kept to a minimal – all white with black baseboard and dark hardwood floors. It has one accent wall finished with solid granite stone, adding more texture and a natural pattern to the space. Furniture pieces are also modern, with high-gloss finishes and stainless-steel legs. You may want to decorate your bedroom in any style and color you want but remember as your bedroom is a place to relax, make sure you choose restful colors. Most top interior designers follow the rule of three by coordinating colors in their color scheme and following the 60-30-10 rule. First choose a basic or dominant color. This should be a neutral color that you can build the rest of your design around. Cream or white are good choices, but if you find these two dull, you can also just choose a softer or lighter shade of a particular color. Earth tones are also a good alternative. 60 percent of your room should use the dominant color. After choosing a basic or dominant color, you can then keep it from being boring by adding decorations in secondary and accent color. The secondary color should make up 30 percent of your room while the accent color makes up 10 percent. Another good way to keep your room from being bland is to incorporate more than one shade of your chosen colors or to use these colors in different prints and texture. Incorporate bolder hues and playful patterns would be in your accent pieces such as rugs, throw pillows and lampshades. 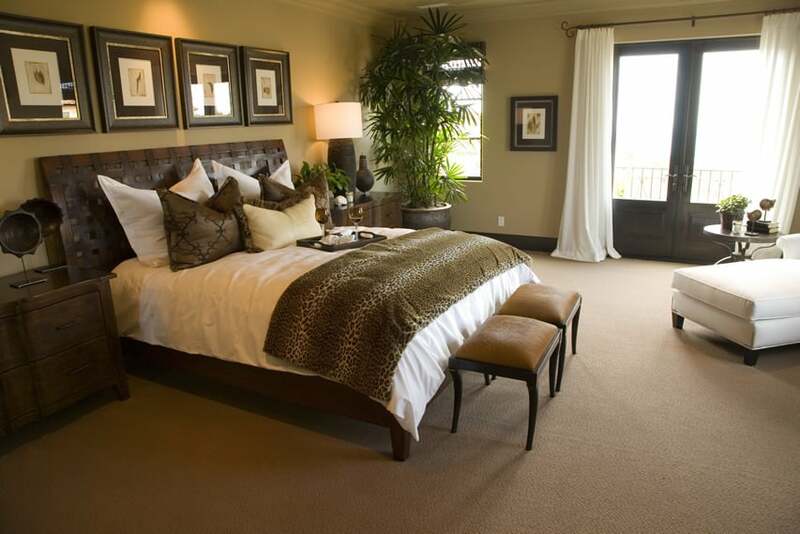 Adding beautiful decor is an easy way to create designer bedrooms that are visually interesting. 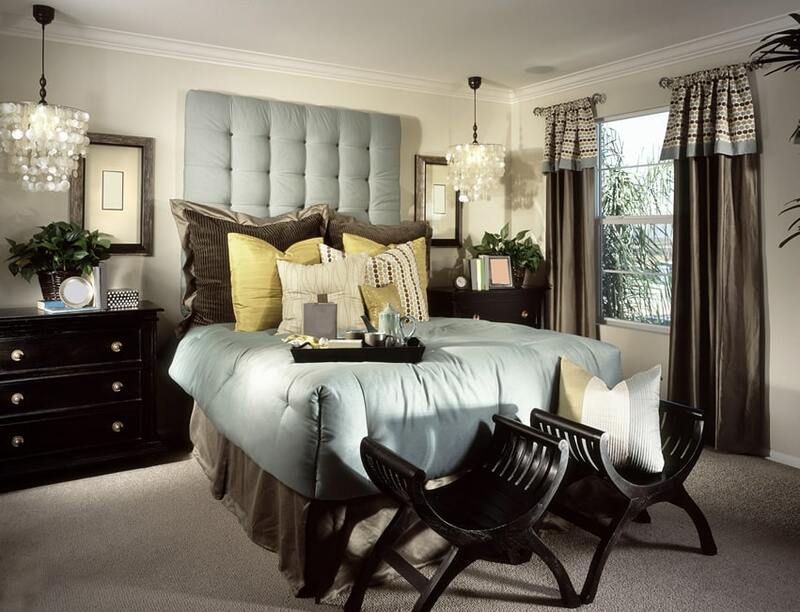 A classic bedroom which uses a neutral color palette with light blue accents. It has dark wengue solid wood floors, beige upper wall paint and white paint for the wall paneling, doors & windows and the coffer ceiling. Furniture pieces are simple and elegant – a large bed with upholstered headboard in a light beige fabric matching the bed bench and Dark Mahogany-stained wooden furniture pieces. This bedroom is a lovely gender-neutral space which makes use of a neutral color palette and elegant materials that will have a universally-appealing look. Walls are of a light beige/oatmeal color, while floors are large ceramic tiles in a brown color. Furniture pieces are varnished and have a dark Mahogany stain, while the area rug used help add texture to the space with being too over-powering. 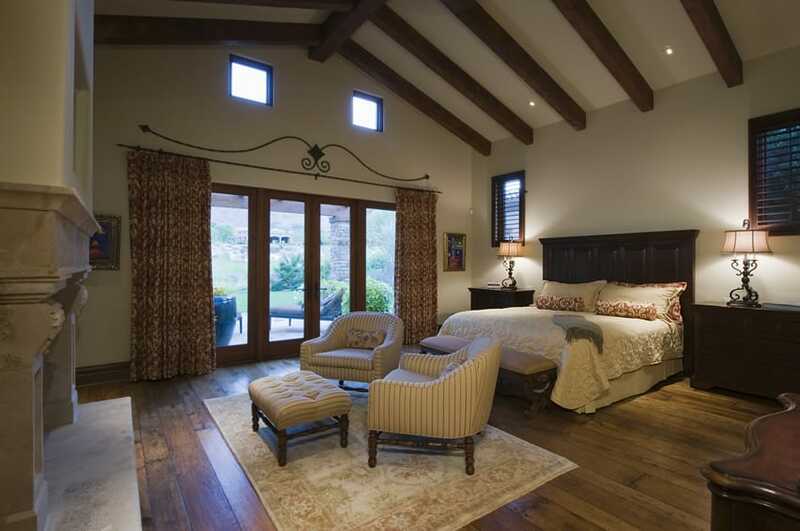 This bedroom has classic country inspiration, with light beige/cream walls, and exposed wooden trusses on the ceiling. The flooring material used is of natural stone, adding texture to the space. For the furnishings, it uses antique furniture in a light walnut finish, like the four-poster bed, nite tables and storage chest. A modern living space which adapts a black, white and red color scheme. Floors and walls are all in black, with white-framed windows and doors. Furniture pieces like the bed and the accent chair are all upholstered in white to stand out from the dark background, while a large red area rug is underneath the large bed, accentuating the bed area. A simple bedroom with an interesting headboard. Instead of using a separate/movable headboard, this design uses the wall as its headboard but creating a padded wall from upholstered square pieces of plywood. Walls are painted in a warm gray color and flooring is carpeted in an oatmeal color, retaining the warm and homey feel of the space. A luxurious bedroom design which uses massive and impressive pieces of furniture to create an expensive and elegant appeal. Floors are ceramic wood tiles in a white/ash color matching the white walls white white-painted wall paneling and carving details. Large French windows help illuminate the space, as well as a few wall sconces and a large chandelier. The bed has a massive tufted headboard in a light cream fabric, matching the tufted accent chair on the side. This bedroom combines browns with yellows and olive greens, helping add a variety to the neutral scheme without going too bright. The light yellow walls help add a little more brightness to the room, while the light beige carpets add elegance and helps neuter the colors in the space. Wooden finishes are in dark wengue, while upholstery and indoor plants add a touch of green to the bedroom. 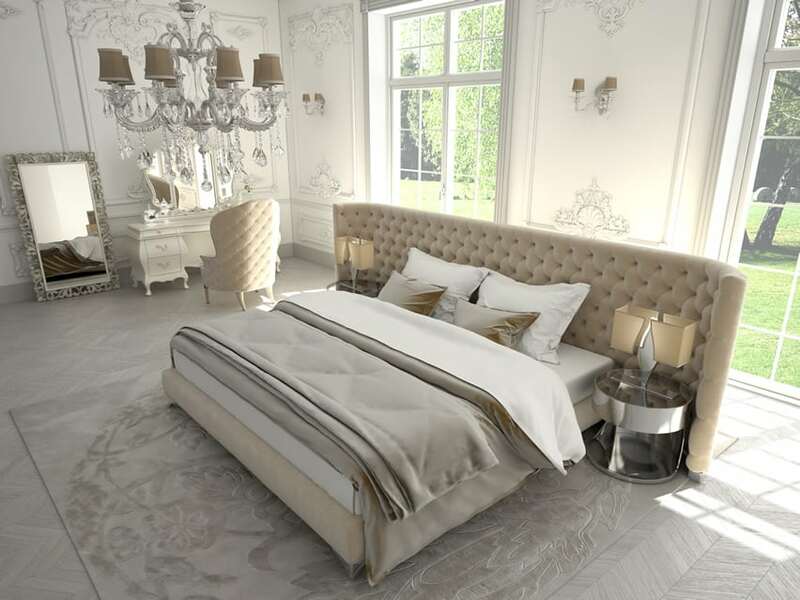 Oozing with elegance, this bedroom will make you feel like a royalty, without going overboard with lavish finishes. Using European furniture pieces with curvy forms and tufting, as well as velvet fabrics, this room gives of an elegant vibe. Walls are simply kept plain and is painted in an off-white color to help tone down the heavy look of the furniture pieces, while the engineered wood floors helps add a warm elegant feel to the space. This bedroom uses neutral turquoise color for its over-all color and combines it with light yellows and dark wood finishes to create this simple yet sophisticated look. The green tones help make the room look cool but cozy and the contrast of the dark wengue finishes on the wood look stunning. This bedroom has a classic appeal, using heavy solid wood furniture that scream elegance and quality. 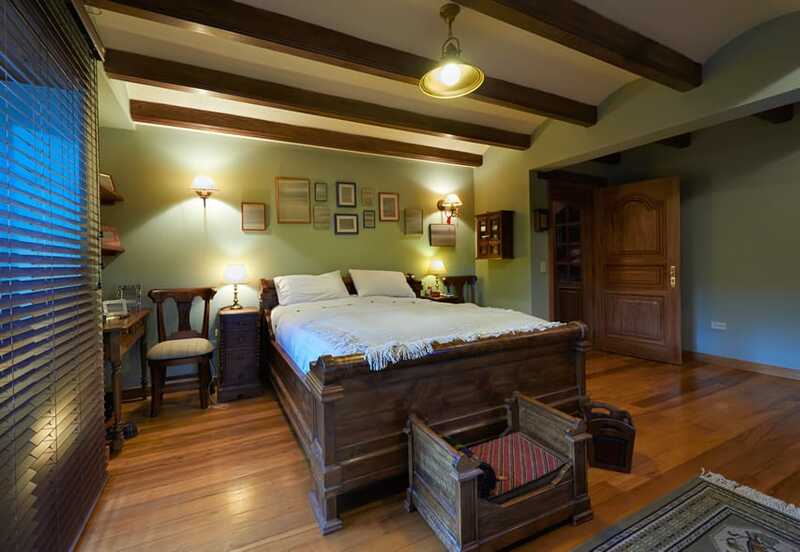 The bed is a large four-poster bed with a leather upholstered headboard and a pair of large solid wood night tables. it also has bentwood side chairs and a solid wood side table. For the walls, it is painted in a light yellow color while the floors are carpeted with an elegant pattern in an oatmeal color to help neutralize the yellows found on the fabrics and drapery. A transitional bedroom design which is cozy with a little masculine appeal. The palette of choice are neutral brown, using beige walls and carpet flooring for that perfect neutral backdrop. Doors and moldings are in dark wengue to add more contrast, while other wooden pieces have variations of walnut finishes. The massiveness and sharp angles of furniture pieces create the masculine appeal, and the white fabrics used throughout the space helps dampen the sharp lines in the space. This bedroom adapts a unique layout by placing the bed diagonally and adding a full-height accent wall behind the wooden bed to “kill” the corner of the room. Floors are carpeted for that elegant high-class look, while walls are painted in white with molding design in walnut stain finish, creating a traditional yet modern look to the space. A traditional style bedroom with a massive and imposing bed with velvet upholstered headboard and footboard. 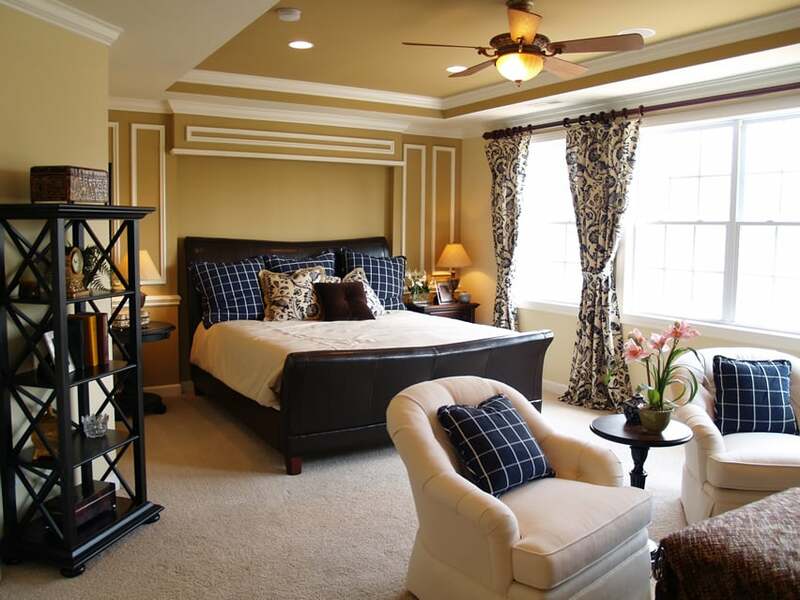 Color scheme is neutral browns, with light cream carpeted floors and light beige painted walls. Wooden furniture are stained in a dark wengue color to add more contrast, while door and window frames are in a mid-tone beige color. This bedroom gives off an imposing appeal with its heavy solid wood furniture pieces and use of animal skin and heavy textiles. While the walls are of simple off-white color paired with beige carpet flooring, the ceiling has wooden planks with a diamond pattern, with exposed beams in a Mahogany finish. Furniture pieces are stained in a dark walnut color and it also incorporates a little reds and greens in the color scheme through plants and accessories. This bedroom has a unique partial division between the bedroom area and the lounging/seating area. It also is able to incorporate an electric fireplace in the thick wall partition. The color scheme used is of yellows and beige, with dark wooden floors, light yellow walls with white moldings and a combination of beige and yellow fabrics, creating a warm and cozy atmosphere. 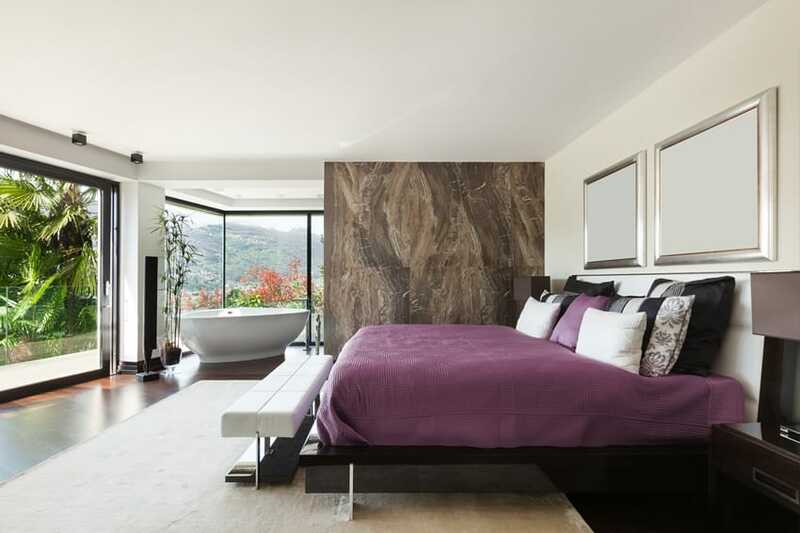 This is a modern bedroom with Asian-contemporary furniture pieces – simple forms and dark wood finishes. Flooring is light gray carpet which matches the light gray color of the walls. It also has an accent wall behind the bed with a texture beige wallpaper and wooden molding details, and another accent wall in front of the bed with faux stainless steel laminate finish with a built-in electric fireplace. The presence of wooden furniture and light oak flooring make this room a classic part of a great home. It perfectly mixes greens, whites, and browns with its walls and a chair in light green, the ceiling, blinds, and windows in solid white, and most of the remaining furniture and flooring made of wood. This bedroom is one that is hard to leave, as it offers space not only for rest but also a fireplace for accommodating guests.It is mainly composed of whites with accents in varying degrees of brown. The bed demands attention with its size. It is covered in a white comforter with accents of gold and metallic brown and maroon throw pillows. The whole floor is covered with a light brown carpet. The fireplace could be found on the right side with a classic chandelier, two white sofas, a lamp, and a tropical ornamental plant. This is the perfect bedroom for a man that loves the outdoors. The indoor plants and the big windows that provide a view of the garden outside creates an outdoorsy vibe and the illusion of openness. 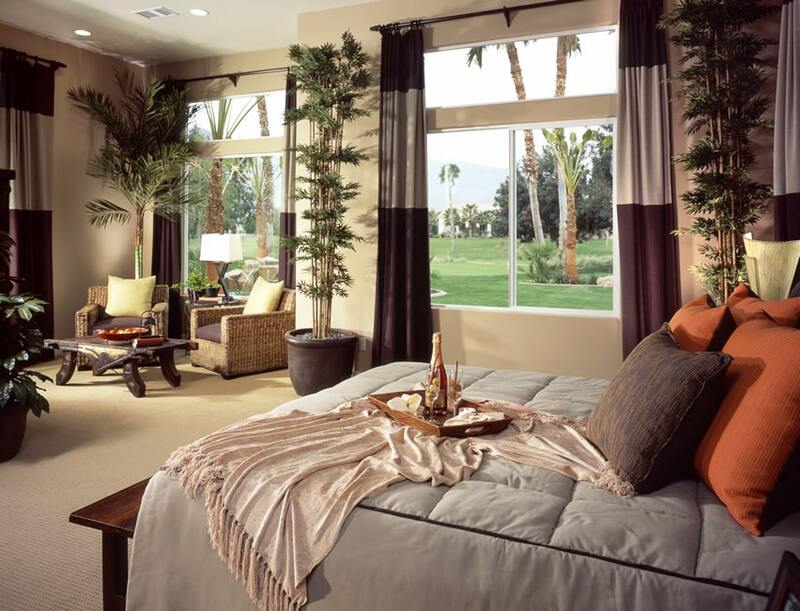 The comforter and throw pillows are in blues and tangerine, while the floors and walls are in oatmeal brown. Two single-seat chairs made of woven wood, black upholstery and topped with cream throw pillows could be found with a glass coffee table with wengue wooden legs on a corner of the room. This room mixes contemporary and classic pieces with a bedside ebony table and two ebony bentwood chairs at the base of the bed. The bed and curtains add life to contrast the dark shades of wood, with polka dots print for a portion of the curtain and a throw pillow, and a mix of pastel yellows and blues for the bed. The headboard is catchy with its height and cushion in the same shade of the pastel blue comforter. This room is the epitome of simplicity and class. The furniture are all made of dark ebony wood, with a black upholstered sofa on the side. The mattress comforter and pillows are in white with accents of light brown, like the cream floor with a light brown textured carpet at the base of the bed. To add some color, a small green plant could be found beside the white lampshade. This classic room has a traditional vibe, especially with a 4-panel folding mahogany room divider that is used as a headboard. 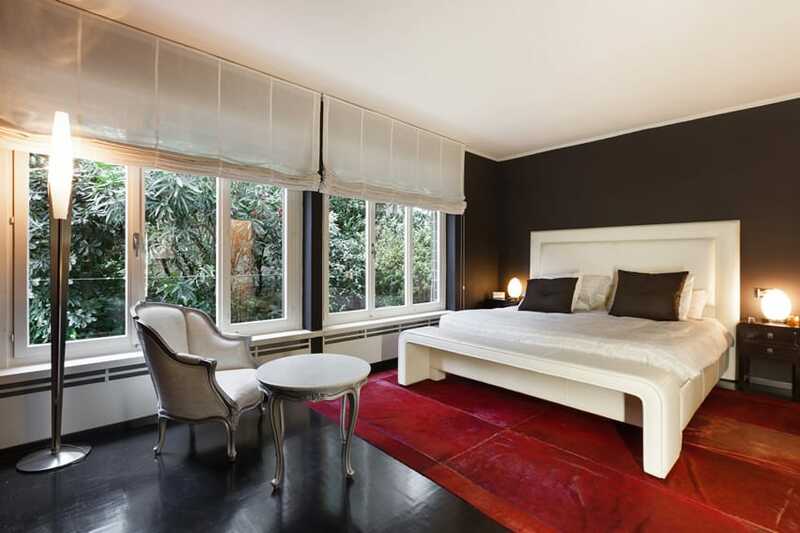 The bed fabrics are in black and white with a bed bench in white upholstery and cherry wood legs. Like the bed bench, the rest of the cabinetry are in cherry wood. More brown of a lighter shade is found on the floor carpet, and some greens are added to give some rest for the eyes from the strong shades of cherry wood around the room. This room has oak wood floors, light green walls, and a big walnut wood bed with white sheets and pillowcases. Above the headboard lies colorful frames in red blue and yellow, giving a youthful feel in the mostly classic room. An intricate wood pet bed lies at the foot of the bed next to a handmade woven rug. This spacious room has a classy vibe due to its impressive tray ceiling and luxurious furnishings. The strongest color is from the mahogany flooring and bed frame. The bed demands attention with its size and high headboard. Two antique white bedside tables could be found on both sides of the bed with a classic white lampshade. A fireplace can be found directly across the bed, and a small 2-seater cream upholstered sofa love seat is found with a black mirror at the far end. The room creates a simple and yet elegant vibe thanks to its vaulted ceiling with exposed beams. It looks spacious with the white walls and ceiling. Exposed trusses, flooring, and furniture are in different shades of brown. Flooring is constructed of lighter oak wood, which contrasts with the dark wengue bed frame and cabinetry. A beautifully carved fireplace makes an inviting spot for the positioning of two chairs and an ottoman for relaxation. 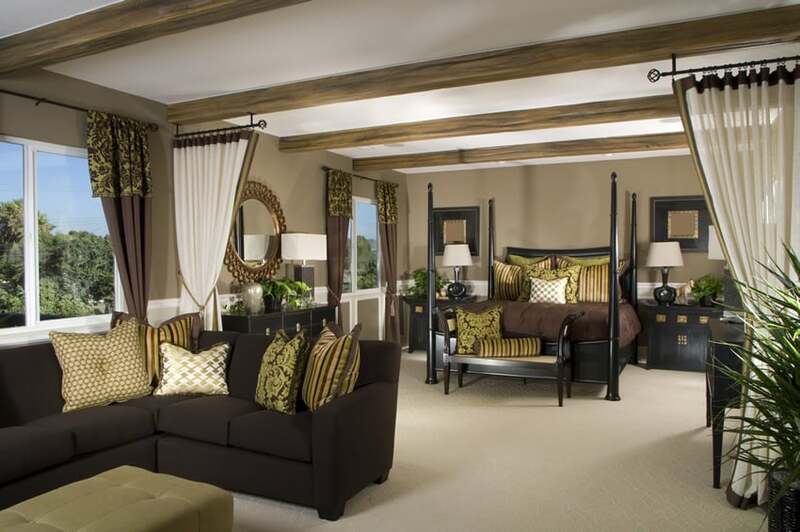 This room boasts of elegance and class in its olive green, gold, brown black, and white color scheme. Earth colors are combined with a touch of gold. The ceiling is white with exposed trusses, while darker ebony is used for the bed frame, bed bench, and cabinetry. Pillows, curtains, and other elements in the room are in green, gold and brown, which perfectly accents the black furniture and white ceiling. Decorative sheer curtains allow for some separation and privacy for the bedroom from the sitting area. This room has a monochromatic color scheme and perfectly joins an elegant and modern feel. A four post solid black bed frame could be found at the center of the room, with a zebra-print bed bench and a black and white carpet at its base. Black furniture could be found in the surroundings, in contrast to the solid white windows and doors. The strong contrast is neutralized by taupe walls. This room feels so close to home with its light green walls, white ceiling, and brown carpet flooring. Furniture are in ebony, while pillows and upholstery consist of browns, tangerine, blue, and floral prints. All the elements in the room if combined together, generates a classy country feel that would surely help in relaxing a busy soul. Designer bedrooms usually mix the wants, personality and favorite colors of the home owner with current styles to create an inviting space that will make them feel totally relaxed. 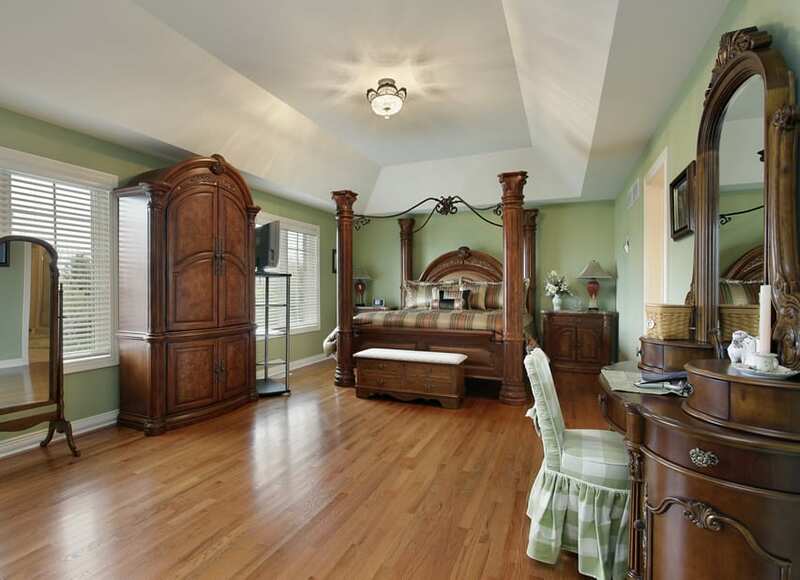 This classy room has a four-post wengue bed and cabinetry. The bed is simple, but is made classy with gold and gray sheets and pillow cases that perfectly matches the matte gold walls. The dark wooden flooring and furniture contrasts white wall panels and windows and ornamental plants are placed inside to add greens to the very neutral color scheme. This room boasts of much modernity and serenity. A massive white bed demands attention with its white sheets, pillow cases, and big headboard upholstery. The bed frame and the bed bench are in solid black and perfectly contrasts with the furry white carpet on its base. A big window overlooking occupies one wall, making this the perfect getaway from a busy schedule. This room is full of simple classic pieces that are very gender-neutral. The flooring and furniture are chestnut stained with accents of pale taupe and white for the floor carpet and bed fabrics. To add life to the mostly matte fabrics, a metallic brown curtain hangs on white paneled windows as well as a dark brown leather couch are added to the room. This is another gender-neutral modern bedroom that maximizes space for storage and cabinetry, but maintains a simple and functional feel. Sheets and pillow cases are in solid gray, which is very easy to eye in contrast with the antique oak flooring and cabinetry and the white walls and lighting. This is a functional classic bedroom with matte gold walls that are accented with white panels and windows. The sheets and one-seater sofas are also in white, while the carpet is oatmeal-colored. These light colors contrast well with the black shelves and black bed frame upholstery. To add variety to the solid colors and a slight modern feel, blue checkered and floral prints could be found on the curtains and pillows. This makes a room that would suit a person from any age bracket. This is a spacious and simple room that is a peace sanctuary in the midst of a busy city. Lots of houses could be seen outside the big white paneled windows, but the aura of this room is a source of peace of mind. White sofas, sheets, ceilings, and lamps add brightness to the room. The whites are accented with varying shades of blues, and some purple and greens. The bed’s headboard is creatively carved with hollow blue rectangles that add aesthetic value to the already beautiful bedroom. 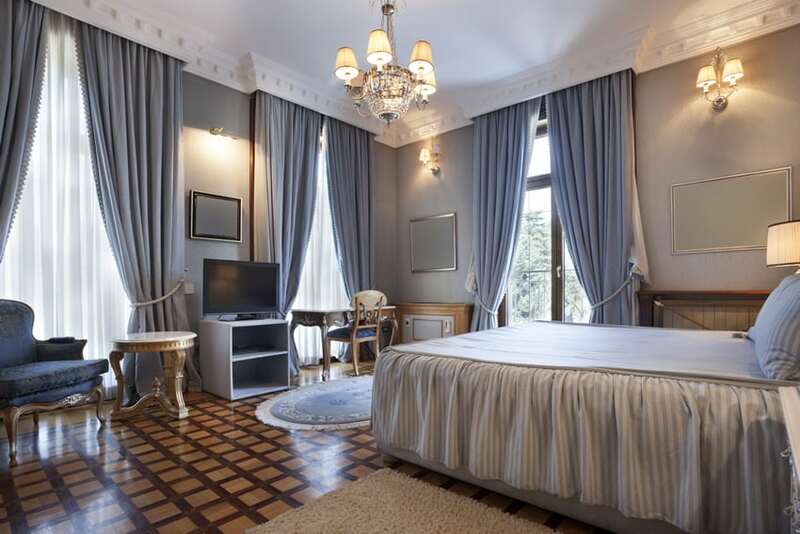 This room is full of elegance with its classic furniture pieces and metallic fabric for curtains and sheets. The natural wood flooring is mostly covered by a big carpet that les at the base of a big and thick cushioned white bed, accented with metallic gray fabrics. More classic furniture could be found by the big paneled windows; 2 chairs,1 small sofa, and a tall table, each uniquely designed, provide room for entertaining visitors or a space for contemplating. This room is very oriental, minimalist, and modern. It’s walls, ceilings, and flooring are all black. The furniture all project an oriental vibe, especially the black and gold bedside table and seat, and the wengue coffee table by the bed. The bed frame is made of gold-stained metal with a metallic yellow sheet. All pillows are in floral red and brown prints. This room is classic, homey, and functional. Aside from a bed for sleeping, a TV for entertainment and wengue cabinetry for storage may be found at the corner of the room the door. On the other side is a khaki sofa with a coffee table in oak and ebony could be found with a big silver and gold mirror on the wall. The bed, like the rest of the room, is in black, brown and gray, just like the rest of the room, with some accents of zebra prints. The relatively small space in this room is mostly occupied by a classy and elegant mahogany bed with gold accents. The same wood stain and design is used for the bedside tables on both sides, which are perfectly designed in a symmetrical manner. 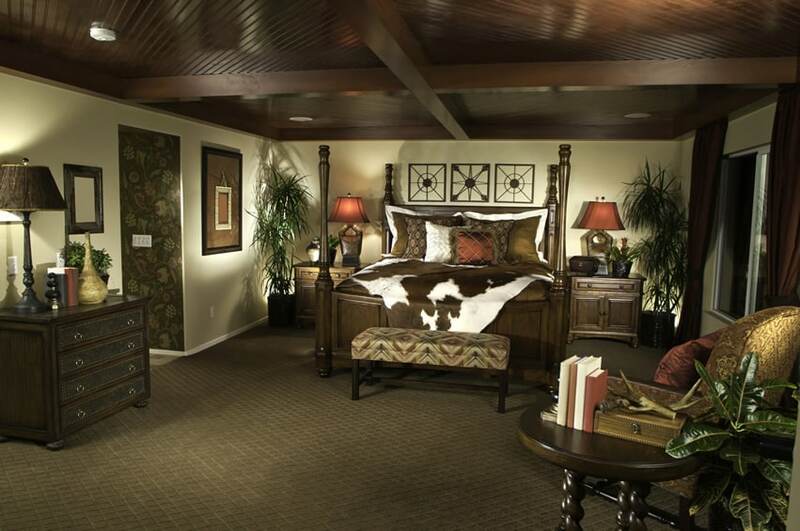 The space above the headboard is covered with brown upholstery and adds more class to the elegant room. The glass chandelier perfectly caps off this room with an aura of luxury and comfort. This simple room has plain white ceiling and walls. The white sheets, curtains, and laminated solid white cabinet doors reflect more light. 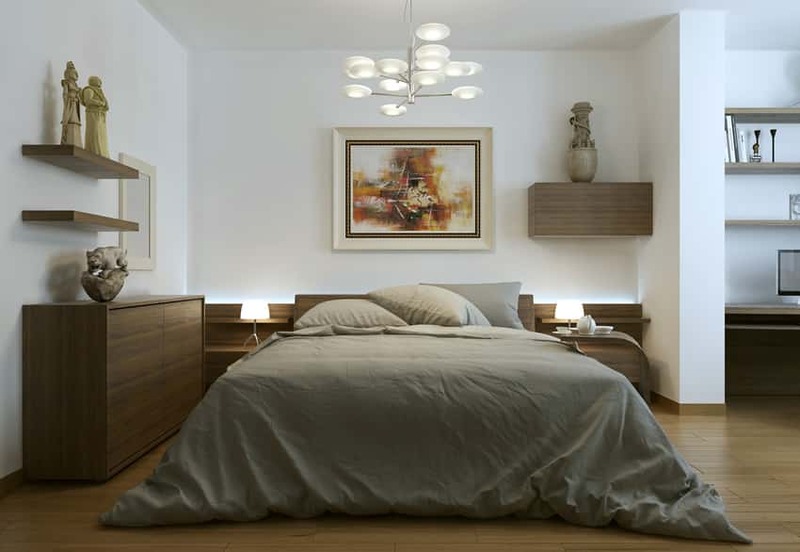 Flooring, cabinet sides, and bed frame are made of laminated light natural wood. and accents of gray could be found on bed fabrics and the silver round mirror. The room is surrounded by taupe walls and an oatmeal floor carpet. A wengue zen bed with metallic brown sheets and checkered pillows could be found in the midst with lampshades and two bedside tables symmetrically placed on either side of the bed. Ornamental plants could be found beside the big white framed windows that provide a view of the community. This spacious room creates an illusion of open space with big windows that provide a view to the landscape outdoors. The bed frame and bedside table are in wengue, in contrast with the light brown floor carpet, white bed fabrics, and cream sofa upholstery. A large custom crafted wood headboard help emphasize the outdoor environment. Some greens can be found in indoor ornamental plants and pillows. This is a classy bedroom whose space is mostly occupied by a massive bed in white and olive green. The whole floor is carpeted with olive green and black pints, and the walls and windows are paneled in white. A touch of black is added on the bed bench and other elements in the room to contrast the light color scheme, which overall provides a very relaxing mood. This classy room is dominated by varying shades of brown. The wall behind the bed serves as a headboard, with glass shelves filled with potted ornamental plants. Beside the platform bed are two classic cabinets with a red lampshade. Since the room is not so spacious, a big mirror is seen on the wall to create an illusion of more space. This room provides a country and homey feeling with its cherry wood windows, bedside table, and bench bed legs. More red could be seen on the bed fabrics, and some darker brown on the bench bed upholstery which perfectly matches the exposed trusses on the ceiling and contrasts with the light oatmeal carpet and cream walls. This room is color coordinated in green and tans and classy. The small space is addressed by the dominant light colors and big glass doors and windows that could be found around the room. Accents of olive green could be found on every furniture piece, creating a relaxing space that is a must for every bedroom. French doors lead out to a lovely patio area. This blue room is very elegant and spacious. A blue bed with gray and white striped ruffles could be found near one corner of the room, facing the television, a study table, a one seat French armchair and an elegant gold and white coffee table. All the furniture are in gold, blue and brown, except for the TV stand that is of the same solid light gray color as the walls. The flooring is made of light brown bordered by dark brown wood laminates that create a classy checkered floor. This minimalist elegant room has a monochromatic theme in black and white. The walls behind the bed are textured in dark gray, and the bed is massive and low with black upholstery that matches the bench bed. Bedside tables and lampshades are also in black, whilst the furry shag gray floor carpet covers most of the room. The ceiling, walls, and floor tiles are in white. Most fabrics in the room make use of a black and white patterns that add more class to the room. This classic room makes use of a brown color scheme. The placement of furniture is asymmetrical due to the room’s shape. A workplace could be found on the far left corner of the room that has a fire place and sturdy desk. On the bed side, a mahogany bed bench is cushioned with black upholstery, at the base of a big mahogany bed with white sheets and a lot of pillows with various prints. Designer bedrooms with can put a feminine touch on the room through the use of fabrics, textures and color themes. This is a classy and feminine room filled with cherry wood furniture and floral red and white prints. The ceiling above the bed is white with exposed trusses, and it holds a hanging light and fan. The bed below it has white, brown, and red prints. Two bed side tables hold identical white lampshades.